An important part of practising art is learning how to deal with negative criticism. If you are just starting out, I am going to give you a heads up…. Not everyone will like your art. Some people will in fact hate it and tell you so. As a personal example, when I was starting out I posted one of my paintings on social media. It was generally very well liked, however there was this one man who seemed personally offended by my painting. I have no idea why, but he certainly did not like it. In particular, he noted how incorrectly I had painted the water. Now I did not get mad or offended. I was actually curious how two people can see completely different things in a painting. I find that fascinating. I also somewhat agreed with the criticism. Truth be told, I did struggle with painting the water from what I remember. No one is spared from open criticism. Even the top masters. 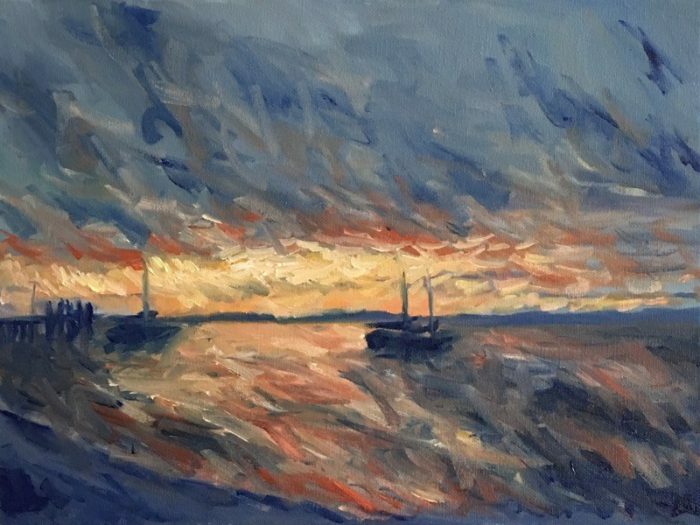 Just look at the likes of Claude Monet, Vincent van Gogh, William Turner and John Singer Sargent. All of them were openly criticised in some way, despite being extremely skilled. When our hard work is criticised, it seems to be human nature to viciously defend ourselves and look for flaws in the person criticising our work. This is because we just don't seem to be able to deal with criticism. But most people are completely missing the point. There is a lot of valuable information in negative criticism. Sure, sometimes it may be uncalled for. But sometimes it is true. If you take your ego out of the equation completely, then you will be able to use negative criticism to your own benefit and grow as an artist. For example, at one stage I went through a pretty experimental phase with my painting which was not liked by my close relations (who certainly do not sugar coat things). At the time, I wrote off the criticism on the basis they did not understand art. But I have now come to realise the criticism was correct! But I was stubborn and did not want to accept my own flaws. Had I taken the criticism on board, I may have saved myself a lot of time. An important lesson to learn in art and in life is that there are always limitations on your own opinion. Never think you are so smart that you cannot be proved wrong. The smartest people in the world understand the limitations of the human mind. So when someone criticises your work, see if you can use that criticism to improve. Maybe that criticism is identifying some shortfalls in your ability. The criticiser may see something that you just don’t. Even if the person criticising your work is untrained, do not make the mistake of discounting their opinion just on that basis. The untrained eye can pick up errors which the trained eye cannot see. I recently took up Brazilian Jujitsu and our instructor told us how it is important that the top level practitioners still roll with the amateurs. This is because the untrained amateurs see things differently. They have no sneaky tricks or abilities. They must rely purely in instinct and strength. Because of this they can quickly expose any general weaknesses in even the most advanced practitioners. The same goes for art. If you completely ignore the opinion of the untrained eye, then you are missing out on valuable information to help you improve. Remember, the majority of people do not practice or understand art. So you need to be aware of how the untrained eye perceives your work. It may determine if you are able to make a living from your art or not. Try and keep your ego out of it. If you can do this, then not only will you stop being afraid of criticism, but you will actively seek it. You will submit your art to competitions. You will post it on social media. You will hang it on your walls. You will improve as an artist! Hopefully this will help you deal with criticism in the future (though I hope you do not have to deal with that much negative criticism). 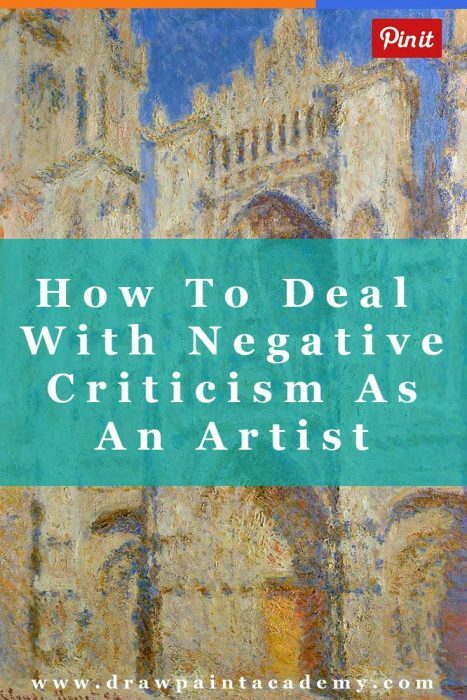 How well do you deal with negative criticism of your art? my mum used to say ‘critics are failed performers’. she was right. anyone who has gone through the process of creating would be foolish to criticize as they know how hard it is to put your work out there. and we can not please everyone every time. I know I love some artist’s work and others leave me scratching my head. but I would never utter a word as I know they have put themselves out there. that takes courage. I respect courage. I think that those who criticize the work of others should make sure that it is considered, constructive critisism, other wise they can undermine the confidence of some artists who may be sensitive. This can have an impact on their work. Not all artists are created equal. And confidence and courage are a large part of the creative process. I paint with about 8 to 12 other artists. ( we are all retired And took up painting activily after retirement). I did a painting of a memory that I had as a child living on a farm in the south. Some liked it and the other half were extremely critical. Of course I was taken aback and hurt. The next day as a group we were showing our art (as a group at a street fair). As I was moving this badly critiqued piece of art to the back of the pile, a women walked by an yelled out, “oh my God this painting reminds me of when I was a kid on the farm. She came over, examined it and asked me for a price. I practically gave it to her because I planned to never show it. In fact, I was going to gesso over it. So now I’m confused. Those same artist who criticized the painting were now saying that I should have put a higher price on the painting. As I continue to grow in my artistry, I’m learning to take all the critiques as positive. But there are just some people that just don’t like your vision as an artist.